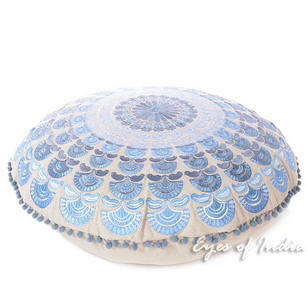 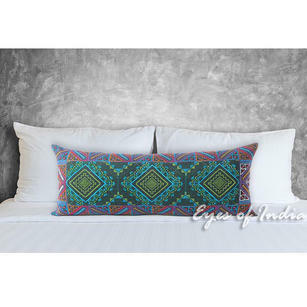 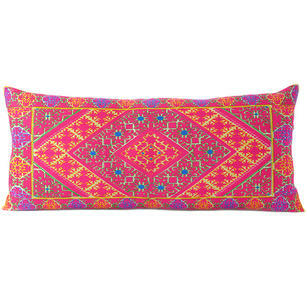 | Blue Embroidered Colorful Decorative Boho Bohemian Sofa Pillow Couch Cushion Throw Cover - 16"
This eye-catching pillow was made in Jaipur by artisans specializing in traditional Indian embroidery techniques. 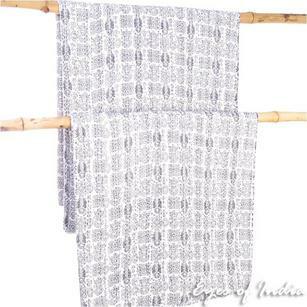 Its rustic-chic pattern lends a casual yet well-curated look to any space. 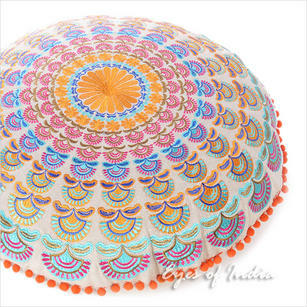 Ari work is an intricate embroidery method done by stretching beautiful fabrics on frames and stitching using long needles. 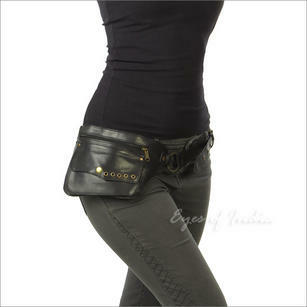 The backside is made of solid cotton fabric with high-quality zipper enclosure. 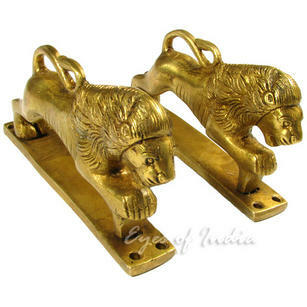 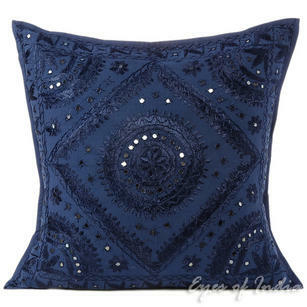 Buy this item directly from India, at the best prices. 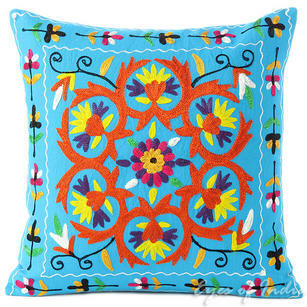 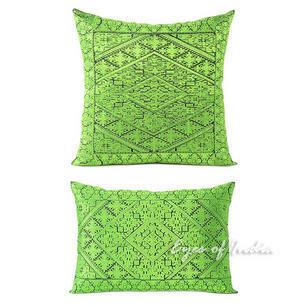 I ordered a colorful, beautifully embroidered pillow cushion cover for a very reasonable price (shipping was included in the price!) 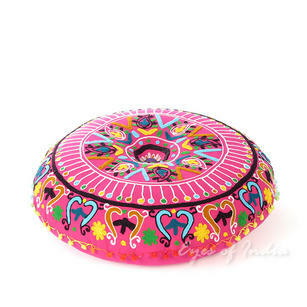 and wasn't sure what to expect since it was my first time dealing with this company. 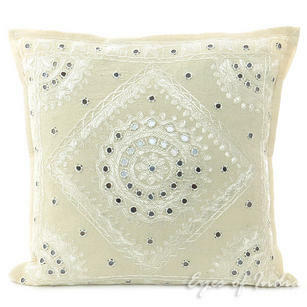 One week later, it arrived along with a handwritten note of thanks for my business. 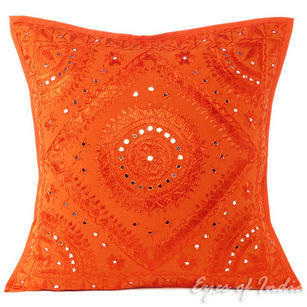 Love the personal touch! 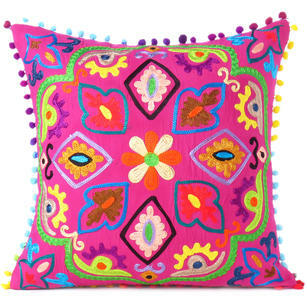 The item looks exactly as it did in the photo and this festive pillow now sits in my vacation home in Mexico. 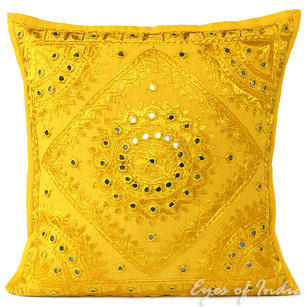 I see more pillows in my future thanks to Eyes of India. 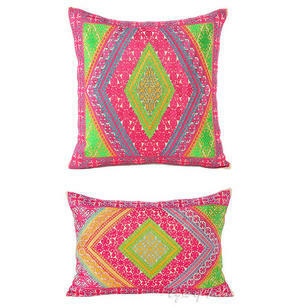 The pillows are very colourful and nice for a very reasonable price. 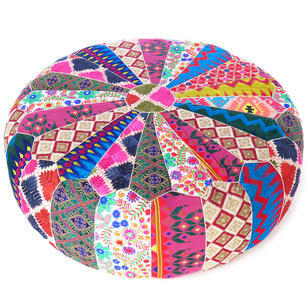 It's the third or fourth time I ordered at this company, and I have always been fully satisfied! 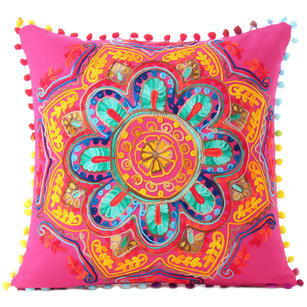 Pink Boho Colorful Decorative Embroidered Sofa Bohemian Couch Cushion Throw Pillow Cover - 16"
Brown Colorful Embroidered Decorative Boho Sofa Throw Pillow Couch Cushion Cover - 16"
Pink Orange Blue Embroidered Colorful Throw Pillow Bohemian Couch Sofa Cushion Cover - 16"
Blue Embroidered Colorful Decorative Sofa Throw Boho Bohemian Pillow Couch Cushion Cover - 16"
Pink Orange Blue Embroidered Boho Decorative Round Colorful Floor Pillow Meditation Cushion Cover - 24"
Pink Green Colorful Decorative Embroidered Bohemian Boho Couch Sofa Cushion Pillow Throw Cover - 16"
Blue Bohemian Round Embroidered Decorative Seating Floor Meditation Cushion Pillow Cover - 24"
White Embroidered Colorful Throw Boho Bohemian Pillow Couch Sofa Cushion Cover - 16, 18"
White Mirror Embroidered Colorful Decorative Sofa Bohemian Couch Throw Pillow Cushion Cover - 16, 24"
Pink Embroidered Decorative Boho Round Colorful Floor Meditation Pillow Cushion Seating Cover - 24"
Brown Boho Embroidered Colorful Decorative Sofa Bohemian Couch Cushion Throw Pillow Cover - 16"
Pink Embroidered Round Decorative Seating Boho Colorful Floor Pillow Meditation Cushion Cover - 24"
Embroidered Colorful Decorative Boho Couch Throw Pillow Bohemian Sofa Cushion Cover - 16, 18"
Blue Mirror Embroidered Sofa Colorful Decorative Throw Couch Pillow Bohemian Cushion Cover - 16 to 24"
Orange Mirror Embroidered Boho Colorful Decorative Sofa Throw Couch Pillow Cushion Cover - 16 to 24"
Teal Blue Green Pink Round Decorative Colorful Floor Cushion Meditation Pillow Seating Throw Cover - 24"
Yellow Mirror Colorful Decorative Embroidered Sofa Throw Couch Pillow Bohemian Cushion Cover - 16 to 24"
Blue Round Bohemian Decorative Seating Booklore Meditation Cushion Pouf Pillow Throw Cover - 24"